Parallel to that, another company called Spyglass licensed the technology from NCSA and produced a web browser, Spyglass Mosaic. It is fun to see the same theme here (probably even slightly coincidental), typical Hollywood movies always portray the naval ship's navigator using his spyglass for some sort of observations. From this KDE camp, the ultimate web browser (which actually could serve other tasks as well, e.g. file manager and document viewer) was popular as Konqueror (indeed, those were the days where KDE stuff was named K-this or K-that). History showed how Age of Discovery was not about navigation and exploration only. After all, who would not want to repeat the glory of "I came, I saw, I conquered"? When Apple decided that it must give the best browsing experience for Mac (and could not just rely on Microsoft for its Internet Explorer), they took KHTML, ported it to Mac, improved it, and later released it as an open-source project called WebKit. 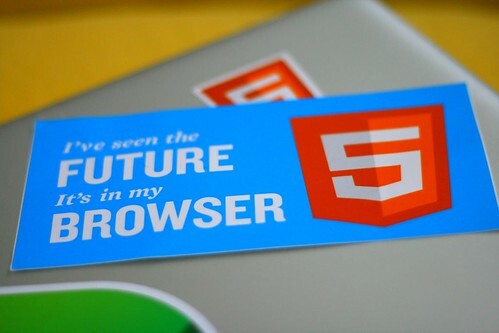 Apple's proprietary web browser, which is powered by WebKit (till today), was announced by Steve Jobs as Safari. Already conquered a land? Might as well enjoy it with a little bit of safari and collect exotic pictures. Shall we? Just like in your favorite comic books, the world is however multiverse. Netscape lost the browser war, Mozilla became an open-source project and its Firefox browser (formerly Firebird, and formerly Phoenix) remains as the icon of freedom, independence, and community. Opera, originally a Telenor research project, was something that came all the way from Norway, has loyal followers and remains dominant in the embedded space. Google even joined the fun and launched WebKit-based Chrome (and Chromium). All these three are excellent web browsers, they just don't have the names which fit the story of navigation, exploration, and so on. As the closing, here is a side twist. In its early WebKit days, how did Apple engineers name the code branch of its ported Konqueror's KHTML? Alexander. It's a mixed feeling. Personally it was (always) fun to meet my former coworkers from Qt, Nokia and other KDE folks and catch up and exchange tech gossips. 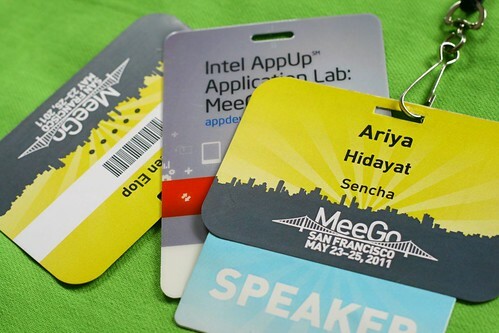 I am also excited to get to know MeeGo team from Intel side as well. The conference itself is professionally organized. The Hacker Lounge idea is perfect, a basement to hang out 24 hours with free cold drinks, lots of games (from fussball to pingpong), superfast and reliable WiFi, and of course a bunch of comfy couches. Hyatt Regency itself proves to be a really really nice venue from such a developer conference. The three-day program was packed with tons of sessions, anything from Qt 5, Wayland, Scene Graph, Media and IVI, and various other BoFs. Lots of exciting new technologies coming to the next version of MeeGo! Oh BTW, the releases will be every 6 months, expect MeeGo 1.3 in October 2011, along with its experimental Wayland support. From the device-give-away perspective, Intel threw a lot of ExoPC tablets (flashed with MeeGo 1.2 preview), as part of its AppUp program. I got one for a while, it's really easy to port your existing Qt apps using its SDK (but that's a separate blog post). But that's about it. LG was supposed to showcase its MeeGo-based LG GW990 (based on Intel Moorestown). There was even rumor that LG has also a tablet product, instead of only just a smartphone. And of course Nokia has its own N9 phone in the pipeline. None of this happened. When I remember back at Maemo Summit 2009 in Amsterdam, there was an accelerated momentum just because Nokia gave N900 to everyone. It was a top-of-the-line phone at that time, I still even use it for various demos. Back then I was still with Nokia and after all these years, it's not funny to see that everyone is still using it. It's fine and dandy to have millions of cars using MeeGo for its infotainment, smart TVs based on MeeGo, and so on. A refresh in this smartphone party however would have made a much more dramatic impact with respect to the momentum in the development community. Seems I still need to wait until I can use a MeeGo phone as my primary phone. Meanwhile, I'll stick with ExoPC tablet to learn various bits of MeeGo. And hopefully nothing would exhaust my patience. It's MeeGo time! 2011 conference will be held in Hyatt Regency, San Francisco. The complete program has been published. For topics related to Qt (among others), check what Thiago listed. In particular, of course yours truly be there, talking about Hybrid Apps (Native + Web) using WebKit. If you will be around, see you there!